Travel in late summer through the colder states, especially in the north-east, and everywhere – in parks, private gardens, and even cemeteries – you will see a bush with large white flower heads, perhaps beginning to turn pink as the nights cool. It may be a bushy plant, or it may be tree-like, on a tall single stem. Old plants may be 15 feet tall. This is the beloved PG Hydrangea, a mainstay of cold gardens since the 19th century. The equally well-known mophead hydrangeas, with their rounded heads of pink flowers, or more rarely blue, will not grow further north than zone 5 (although there are some remarkable modern varieties that will), so the ‘PG’ is the top choice for late summer and fall flowers. Anyone who has gardened in zones 3 and 4 knows this plant, and almost everyone loves it. But let’s be honest for a moment – it is not at all the perfect plant, but ‘beggars can’t be choosers’ as the saying goes. It often is too large, especially for smaller gardens, but its biggest fault is the weak stems. All too often it has the frustrating habit of developing terrific big flower clusters, only to have the stems bend over, or worse, snap, as they mature. Instead of a bold, upright plant, they regularly hang their heads, looking forlorn. Keen gardeners start staking, tying each stem upright, and this works for smaller plants. But big plants can have a hundred flowers, so individual staking is out of the question. Grown it in full sun, with minimal spring pruning, and a PG will keep it flowers more or less upright – at the cost of them being much smaller, which defeats the goal of big, showy flowers. However many gardeners want to take advantage of the shade tolerance of hydrangeas, to fill those awkward shady corners, and then the old PG is really prone to flopping, as the stems become elongated in lower light levels. If you grow the PG Hydrangea, you will know exactly what I am talking about. So here is the good news – get ready to ditch your old PG plants and replace them with something remarkable. No, this is not some ‘alternative’, that ends up being a completely different plant. Nor is it some patented novelty with bizarre characteristics that you will quickly learn to hate. That old, flawed PG has been re-worked and re-furbished, until now it is fresh and new – the PG of our dreams. This miracle plant is called the Phantom panicle hydrangea, but it is no ghost. This is a PG that holds its heads up tall, even after hard pruning and the resulting 15-inch-long panicles of white flowers. No more sad plants with a skirt of drooping flower heads, no more broken stems after a shower of rain. Instead this new plant is bushy and rounded, with all the flower clusters held upright on strong, sturdy stems. Other than that, this plant is just like its original, only much, much better. In fact, the Phantom Hydrangea is so much better than the original PG that the prestigious Royal Horticultural Society has de-listed the PG Hydrangea from their Awards of Merit scheme and replaced it with the Phantom Hydrangea. That’s right, they took the old form right out of their recommendations, something that hardly ever happens. They now consider it not really worth growing anymore, given its fantastic replacement. Since the Awards of Merit is the source used by many experienced gardeners to help them to choose the best and most suitable variety from the extensive list available for some plants, this is indeed quite a change. But wait, there is more. While the Phantom Hydrangea is new in North America, it is still a large plant. Not as big as the old-fashioned PG, which can easily be 12 to 15 feet tall in time, but still reaching 8 feet or more. Smaller gardens need something smaller, and that too has been solved. Already more well-known to cold-climate gardeners is the Limelight Hydrangea, and its smaller sister, the Little Lime Hydrangea. Both have mature flowers that are white toned with chartreuse green, a very modern color adored by flower arrangers. Limelight can reach 8 feet too, but with a little pruning can easily be kept to 4 or 5 feet tall. Little Lime is easily kept around 3 feet tall, and it will rarely grow larger than 5 feet, even with no pruning. They both have much sturdier flower stems too, so floppy flowers are much rarer in these varieties. What is the background to this story, and where did the old PG and the new Phantom come from? The answer is an insight into the world of plant selection and breeding, and a story of success. The PG hydrangea is more correctly called Hydrangea paniculata ‘Grandiflora’. It is a very old variety that was found in Japanese gardens by the doctor, botanist and plant explorer Philipp Franz von Siebold. He brought it back to Europe around 1867, and from there it quickly made its way to North America. Because of its winter hardiness it proved even more popular there than in Europe, and quickly became a beloved plant, and a garden standard. Hydrangeas have two kinds of flowers – small, fertile ones that make seeds but have no petals, and large, sterile ones that have petals but make no seeds. These are mixed together in the flower heads. Wild plants of this species mostly have the small fertile flowers, so they are not very showy at all. The garden form von Siebold found had mostly sterile flowers, making large flower heads. The flowers last a long time because the plant is not diverting energy into seed production, and the flowers just last and last, a real bonus. Now where did the Phantom Hydrangea come from? In the Netherlands there is an area called Boskoop, around the town of the same name. This is ‘ground zero’ for flower and plant production in Europe, and for many, many years it has been the birthplace of some of our most beloved garden plants. It was here, in 1990, that Peter Zwijnenburg Jr, a local nurseryman, found a remarkable seedling of the panicle hydrangea, that with its ghostly-white flowers he named ‘Phantom’. It received an Award of Merit in 2008, and has now come to America, where it is set to push all those old PG Hydrangeas out of the garden. The Limelight Hydrangea is also a Dutch discovery, while the brilliant ‘Little Lime’ is by contrast an American discovery, produced in Grand Haven, Michigan, in 2005. 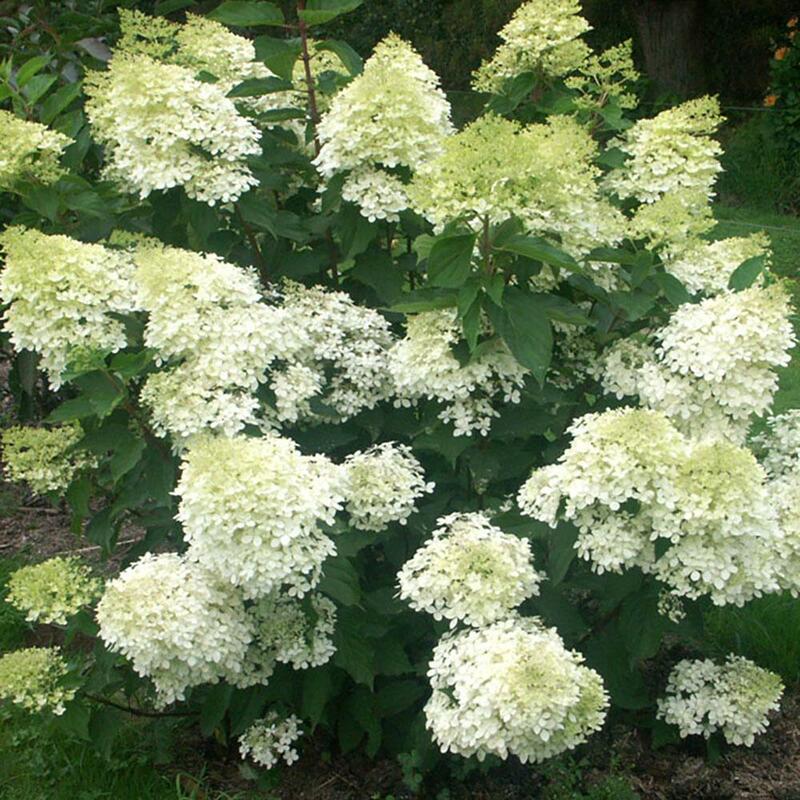 Breeders in a special program took the Limelight Hydrangea and crossed it with several other forms of Hydrangea paniculata, until they found the seedling they were looking for. So unique is Little Lime that it was patented in 2011, under the name, ‘Jane’. If you garden in cold areas, or indeed anywhere except zone 9, get out your spade this spring and take out that tired old PG Hydrangea. Replace it with the Phantom, or if that is too large for you, a Limelight or Little Lime instead. There are going to be lots of places around your garden for these great new varieties. They make lovely informal hedges or borders for example. Now sit back and enjoy a true renaissance for an old favorite – the same, but so much better you won’t believe your eyes.